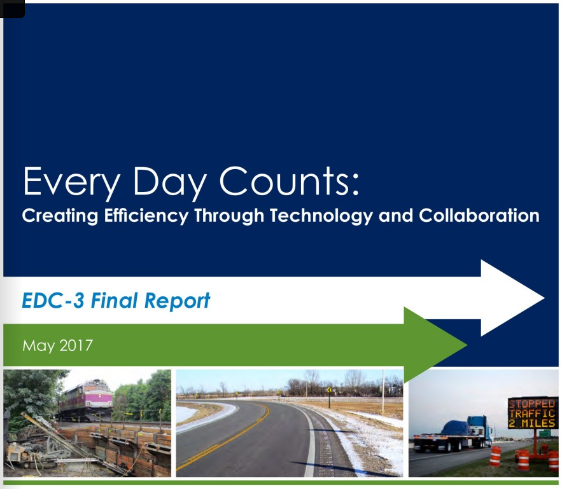 USDOT has published their final report on the activities included in Every Day Counts 3. That included the promotion of work zone ITS. We talked about their efforts in past posts (10/27/14 and 12/14/16 ) and applauded both their efforts and the results, but now we can look at the final numbers. Read the report HERE. When they began in January 2015 there were 7 states that had already made the use of technology to reduce work zone traffic impacts a mainstream practice. 8 more states were in the assessment stage at that time. Bu December of 2016 – just two short years later – 11 included work zone ITS as a mainstream practice and 13 more had moved to the assessment stage – a 37% increase! More important, those efforts are already bearing fruit. Wisconsin’s initial tests indicate a significant reduction in end-of-queue crashes. They are now working with a university partner to develop a queue warning system decision support tool to help project designers know when to include a system in their jobs. Illinois DOT has awarded on-call contracts to provide work zone ITS system in three of its districts. They, too have studied the effectiveness of these systems. Once they finalize their research they plan to incorporate that in their future system deployments. And New Jersey DOT developed scoring criteria for designers to use when determining whether work zone ITS should be included in a project. Work zone ITS was also added to its preliminary engineering checklist as a tool for mitigation of work zone impacts. Thanks again to FHWA for their foresight and hard work on this. It was just the push states needed to get started in work zone ITS and is sure to save a great many lives in the years to come!